When one is at Crichton Collegiate Church it is easy to believe that one is miles away from ‘civilization’. Because the area is relatively isolated and not frequented by many visitors wildlife abounds. This butterfly was basking in the warm late afternoon sun. None of us, to our embarrassment are knowledgeable about butterflies so we cannot identify this one. 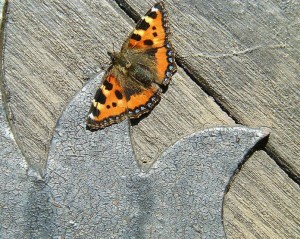 Stop Press: We think we have identified the butterfly – it is a large Tortoiseshell butterfly. 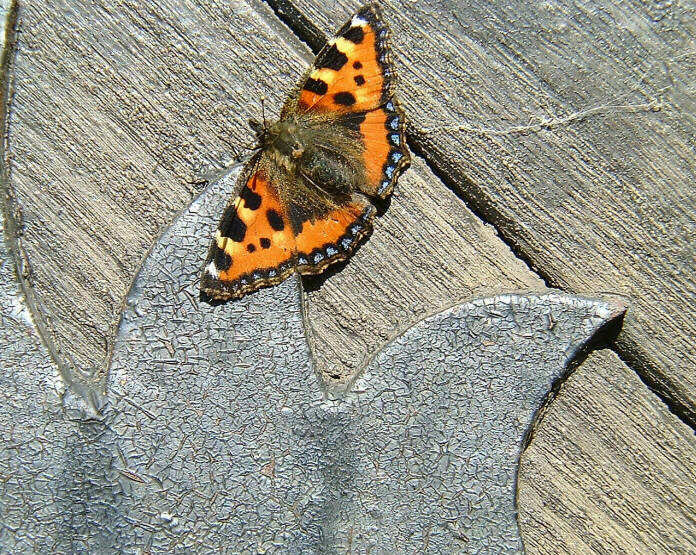 We compared the image with those posted on The Butterfly Website (link below) and the large Tortoiseshell seems to be the closest. There might be slight differences because The Butterfly Website is American and the butterfly varieties are somewhat different to those here in the UK. You might wish to think about taking a pair of binoculars and a camera on such a visit as there is plenty to see and to photograph. If you intend walking on to Crichton Castle then reasonable foot-ware is advised as the track is rough and the last stretch up to the castle is quite steep. If you visit Crichton Collegiate Church (or any other such place) please respect the peace and quiet and do not disturb the wildlife.